I have to admit to having not known of Ehlers Estate prior to meeting their Wine Club and Social Media Manager, Elizabeth Smith, at Taste Camp Maryland earlier this year. We had a BYOB night during the Camp and Elizabeth brought Ehlers’ sauvignon blanc and flagship 1886 cabernet sauvignon. Having had a small glass of the sauvignon blanc and a glass of the 1886, insufficiently decanted, Elizabeth offered to send samples for Good Vitis and I accepted with the caveat of setting up an interview Ehler’s winemaker, Kevin Morrisey, to round out my profile of the winery. My interactions with Elizabeth and Kevin have been fantastic and so it wasn’t a surprise when the wine lived up to the reputation. Ehlers has been around for a long, long time – the late 1800s, actually; pretty hard to speak about Napa’s pioneers without referencing Ehlers. The building that is Ehler’s winery today is a stone barn completed by Bernard Ehlers, who bought the property, in, yes, 1886. One hundred years later, the French couple Jean and Sylvaine Leducq bought the estate and are absolutely committed to producing Bordeaux varieties that can stand up to the best in the Valley. To that end they brought on Kevin Morrisey in 2009 to make their wine. Kevin comes with some pretty good pedigree, having interned at Chateau Petrus (yes, that Chateau Petrus) before landing at Stags’ Leap Winery where he became assistant winemaker. He was eventually poached by Etude Winery to take up the head winemaker position there before going to Ehlers because of the opportunity it presented to focus on terroir-driven, site specific, estate wines. A rose fanatic, Kevin proudly takes credit for starting the rose programs at both wineries, a tradition he continued at Ehlers. He loves rose. Loves it. When I poured his rose the color was so impressive I didn’t want to consume it because then I’d have nothing but the picture left. The picture above doesn’t do it justice. It was, and this is coming from someone who doesn’t much care about the visuals of wine, one of the most visually stunning things I’ve ever seen. It looked like artificial watermelon coloring, but it glistened and gleamed in the sunlight and it was just one of the most gorgeous things I’ve seen. I asked Kevin about the color and he beamed through the telephone as he explained some of the geeky science behind the color of wine. There’s something that goes on in the color of wine that isn’t fully understood by science. If you dilute red wine, the color change is not linear, but no one is exactly sure why. Further, if there’s not enough color in a wine it ends up being an unstable wine. For example, some older red wines turn brownish-orange in a way that doesn’t look natural for grape juice and is a sign that the wine is declining. Kevin really does not want his wines to turn those colors, so he aims to ensure long-term stability. He prefers low alcohol, high acid wines (meaning a low pH). When you have lots of acid and a low pH you can get a redder hew in a rose because deeper red colors come out at higher levels of acidity. Ehlers’ rose is indeed very high in acid, more than any other rose I’ve had, which explains why I’ve never seen one with such a brilliant color. 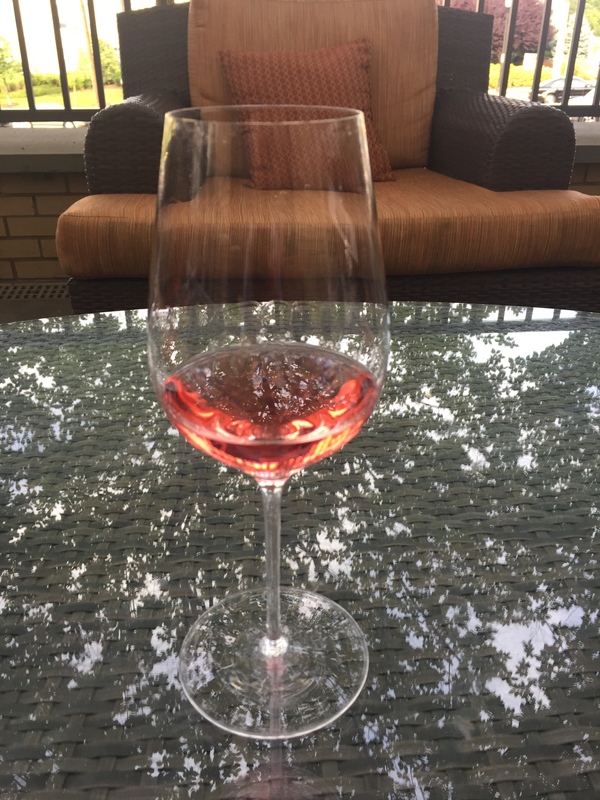 Selling rose has become easier over the last decade as there has been enough consumer education for people to reach the point where they no longer expect a sweet wine when it is poured for them. However, good rose remains the hardest wine for Kevin to make: you want the fruit and aromatics of a red wine with the great acid you get on a crisp white; or, put another way, you need the tannin and color of a red wine in a wine that shouldn’t be red. It’s a very tricky line to find, but Kevin has nailed it. Ehlers is a small producer bottling only 100% estate wines off their 40 acres of vineyards. Kevin and I discussed how he approaches the Leducq’s vision of creating best-in-show Bordeaux varietal wines from Napa and he begins the story with their vineyards. They do not source fruit nor plan to source fruit, which sets Ehlers apart from many, many other Napa producers, even some very good ones. Kevin named several reasons for this, but the one that caught my attention, that I found most interesting, is that he isn’t interested in dealing with subpar fruit. At first read that sentence isn’t surprising. If anything it seems like a ‘well duh’ line. However, vineyards known for producing a top-notch varietal will often require clients who want access to that fruit to purchase their subpar fruit as well, and so if your goal, like it is at Ehlers, is to sell only your best effort, you can’t get roped into a situation like that, and so to ensure his wines are consistently good he sticks with the one source he can control: his own vines. Ehlers’ terroir is entirely their own, the only winery producing from those vineyards. Farmed organically, the vineyards’ location is critical to Ehlers’ success as well. Located on a bench in Napa Valley and planted on well-draining soils with a good deal of cobbled rock, the vineyards sit at the narrowest point of Napa Valley, which creates a venturi effect (if I can apply that reference to wind) that whips the wind through the vineyards with regularity, helping to moderate temperatures. This doesn’t necessarily make it easier to identify an Ehlers’ wine in a blind tasting, but it helps Kevin and his team nail their consistency from year-to-year, which in turns helps build and sustain a loyal consumer following. That consumer following comes also from the winery experience they receive. Kevin is known for spending a lot of time in the tasting room himself, which on its own isn’t likely enough to drive sales, but it is indicative of the amount of effort the Estate puts into its consumer experience. I’d wager that generally speaking winemakers avoid the tasting room, so when you have someone like Kevin eagerly making time for it you know there’s a real commitment to the constomer. That commitment is clearly shared by the rest of team, and is certainly something I’ve experienced with Elizabeth. As someone with limited cellar space, I wanted to know why someone would purchase an Ehlers wine over the competition, and Kevin began by explaining that it’s because of the wholistic, hands-on approach that goes into producing a bottle of Ehlers. From the vines to bottling, Ehlers is entirely hand made by a small group of hard working and nice people dedicated to delivering their best in every bottle (he used the term ‘farm-to-table’ more than once). One of the most satisfying parts of the job is when he can authentically attach the wine to the place and the people for a customer. When you buy a carton of Horizon organic milk (his example, not mine), with the cute and happy cows on the carton, you think there’s a dairy somewhere out there with endless rolling hills where these cows churn out the best milk, yet that’s not the reality of Horizon’s operations. Kevin and the Ehlers team, however, deliver the wine version of that and helping people see that is of critical importance to everyone at the winery. With this in-house approach becoming less common in Napa, Ehlers is able to leverage their farm-to-table reality to earn a lot of respect among fine wine consumers who remain loyal to the winery because they are treated as though they are family. I asked Kevin the same ‘why would someone want Ehlers’ question a second way: why would a sommelier pull a bottle of Ehlers over a competitor’s wine? The answer is consistency. A sommelier can go to Ehlers because they know the bottle is going to be what it should be: a pure expression of a special part of Napa. When Kevin was told this by a somm, it was a great compliment because that’s exactly what Kevin is trying to do: be true to the craft, be true to the vines, and deliver good, site-specific wine at a consistently high level. The wines do speak for themselves, I can attest to that now. They showed dramatically high levels of quality across the lineup and each delivered great pleasure. I found the reds to be approachable now, especially with a few hours in the decanter, but I can see all improving with at least a few years of aging, especially the 1886. The consistently well-executed balance and structure of each wine seems to be a hallmark of Kevin and his team at Ehlers, and is a dead give-away that they know what they’re doing. Now that I’ve spoken to Kevin and Elizabeth and tried their wines, I’m looking forward to visiting on my next trip to Napa to get that final, and key, Ehlers experience. All the wines were received as trade samples and tasted sighted.